Do brands really create value? Will Old Spice’s tornadic viral campaign and sudden “influence” improve Procter & Gamble’s bottom line? Actually a number of events and trends have conspired like a perfect storm over the last several years to put brands and their stewards on the hot seat. Do brands really create value? Will Old Spice’s tornadic viral campaign and sudden “influence” improve Procter & Gamble’s bottom line? The explosion of social media channels and technologies has forced brands to play catch up with consumers and often into becoming awkward or unwanted “friends”. If Edelman’s trust index shows that we trust our friends less today, then we probably trust our brands and their leaders even less. The flowering of “personal branding” has also diluted the meaning and influence of corporate branding. With brands and CMOs under stress, their roles called into question, companies (and even customers) now want more data, metrics and accountability. And there is no shortage of social media and brand buzz monitoring services and tools to gauge brand performance in the evolving space. There are rankings too, such as the Vitrue 100. Facebook and Twitter of course have worlds of real-time brand data and rankings to publish and they do. A new confluence of market forces (including popular interest in charitable giving post-Haiti quake, the coming of age of the idealistic Millennials, public anger over Wall Street bonuses, the growing Sustainability movement and near universal hostility directed at BP–“Beyond Pollution”) is requiring brands to be socially “good”–hence more rankings and metrics: Brandkarma.com; PSFK Good Brands. Of course there are already rankings for brand financial value: Interbrand; Millward Brown BrandZ; Credit Suisse Great Brands; brand equity: Equitrend; and brand word-of-mouth buzz/promoting: McKinsey; Net Promoter Score — all of which try to correlate a brand’s score with its bottom line. The methodology was developed in conjunction with MIT Sloan statisticians and Lightspeed Research. Brand Social Currency is defined as the extent to which people share the brand and/or information about the brand as part of their everyday social lives at work or at home. It is made up of six key dimensions or “levers”–Utility; Affiliation; Identity; Conversation; Advocacy; and Information. The study surveyed 1000 respondents on more than 60 brands across a dozen categories. Questions for each lever were posed to brand users. Results then rolled up into a composite Social Currency score. It will be fascinating to see whether and to what extent Old Spice will smell stronger Social Currency and unit sales as a result of its recent brand investment. 1. 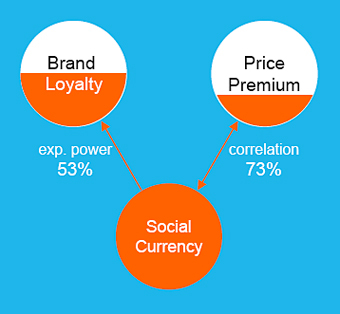 Social Currency significantly drives brand loyalty; brands with a high Social Currency command a price premium. 2. The importance of the six levers that make up Social Currency varies by brand category. 3. As expected, Toyota’s Social Currency score dropped notably between December 2009 and February 2010 (the Toyota part of the survey was run twice). Kevin Randall is Director of Brand Strategy & Research at Movéo Integrated Branding (krandall@moveo.com). His expertise is understanding, integrating, and applying research and brand strategy to create business and customer value. Kevin has been invited to speak on brand topics by Google, Harvard Business School, Wharton and Kellogg, and his articles have been published on six continents. His clients include Siemens, CareerBuilder, Cardinal Health, Molex, GOJO/Purell, and Cancer Treatment Centers of America.